Food, Family, Fun. : These are a few of my favourite things! I am often found chatting to other Moms about packing lunches. Two things that usually come up are where are good places to find certain items and what they should buy to get started. I have packed a lot of lunches in the past 5 years and have definitely learned what works for us and have have settled on some favourites. Here's a round up of those favourites. I admit that I have WAY more lunch making items than I need. You might have noticed this if you've been following my blog for awhile or have seen my post about storage. 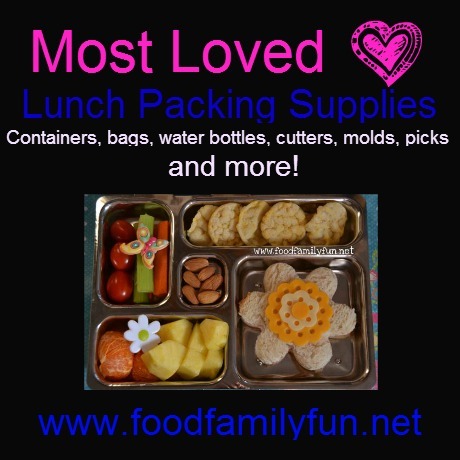 Well, my stash has increased since then and I thought with Back To School around the corner I'd share some of my most loved lunch packing items. I personally own and use all items exactly as shown unless specifically noted. This isn't meant to be a starter list as it's still more items than you NEED to get started. For a starter set, I recommend buying some fun bento boxes, a set of EasyLunchboxes or a Planetbox and then adding some cutters - sandwich sized and mini, sandwich or cookie stamps, silicone cups and a few decorative picks. If you find you've been bitten by the fun lunch bug you can expand from there! This is a long post so I'll separate into categories for ease. New Kid on the Block for 2013-2014 school year. The only new lunch container that I am buying this year is the Planetbox Shuttle. It has just been released this summer and I have been given one for review. I will definitely be ordering a couple more and I will review it shortly on my blog once I have had a chance to use it a few more times. Cute Snack containers - just for fun! There are so many to choose from. Insulated for Hot food lunch container. I don't send a hot lunch very often, when I do it's leftover spaghetti or soup. My children have said that their lunch remained warm at lunch time and they like the designs on these containers. They are also easy to fill with a wide opening. I didn't buy anything else to try as these work well and they are infrequent use items we don't need more than one per child! These are the ones in our current rotation: Klean Kanteen with sport cap, CamelBak (available locally at People's Pharmacy), Skip Hop (Available locally at People's Pharmacy - best for my youngest. It's light and the best cup I've ever given her that is resistant to huge spills when she purposely shakes it upside down! ), Thermos Funtainer. In my opinion, the perfect water bottle is stainless steel, insulated with no straw, easy to close and leakproof. I don't own such a water bottle but all of these have performed well for us last year and some brands have been used by us for years! As I am always on the hunt for the perfect water bottle I will be testing out some new ones this school year. Specifically the Eco Vessel and two different Nalgene water bottles shown below. As straws are such a pain to clean (even though we use the Dr Brown's baby bottle cleaning brushes!) I am willing to choose BPA free plastic over stainless steel to avoid a straw. Stainless steel can be heavy for my littler children also so I'm hoping that these will be a good choice. If you have a favourite water bottle that I have not mentioned here and you think I might like to try it - leave me a note in the comments. PRETTY PLEASE. These are both good choices. The planetbox lunch bag can fit an ice pack, cloth napkin, planetbox lunch container and cutlery on the inside and a drink and snack on the outside. The EasyLunchBox can fit the EasyLunchbox container flat on the bottom so it is not carried on its side, plus ice pack, cutlery, cloth napkin, water bottle and two small snack containers. Either one is also suitable for our pizza lunch day - although we do have some other character lunch bags that get a little love on pizza day when I am only sending a reusable plate, small fruit & veggie side, plus cloth napkin and a drink. It's pretty hard to pick a favourite out of these. I use them with their corresponding containers so both are used regularly. If I need to send two snacks then 9 times out of 10 I send an EasyLunchbox to school. This arises when there are after school activities at school for my oldest child as she needs to bring a mid morning snack, lunch and then a small snack for after school before her activity. My younger children do not take a morning snack as they have community snack, so if they stay at school for an activity the one snack is adequate and the Planetbox can easily accommodate them. I have some favourites for sure! Cutters can be used for almost anything. Larger ones are great for sandwiches, homemade bread or biscuit shapes, single serving pizza crusts, pocket pastries. Mini ones are great for fruit, vegetables, dried fruit leather, homemade cheese crackers, cheese, ham or veggie toppers for sandwiches or salad, mini cookies. Really if you use your imagination the possibilities are endless. You might have a bunch of suitable cookie cutters at home already. Get them out and think of some new uses for them! Wilton Comfort grip cutters are great for sandwiches. They are deep and metal so it's easy to cut through a fully assembled sandwich. A good local shop for Wilton items is International Imports. They will have a selection of comfort grip cutters, silicone cups, and other cake & cookie making supplies that are adaptable to lunch making. I often use the daisy shape below to make 3 hearts. CuteZcute cutter set - makes several different shapes - bear, frog, pig and cat. You can make cutouts or stamps and their are many possibilities with this cutter set; it's not just for sandwiches. The little tool that comes with it is perfect for use with all mini cutters when you need to pop out a small cut out. Fun Bites cutter. Makes perfect little squares. I use this for my toddler often. Great for sandwich on a stick too. Possibly available locally at People's Pharmacy although I have not checked that it is in stock recently. Lunch Punch cutter sets. These are plastic sandwich cutters. Although not the advertised way, the best way to use them is to cut out the top slice of bread and leave it in the cutter, then cut through the rest of the assembled sandwich. This is particularly important if you have soft bread to keep the bottom slice from being flattened too much. For firmer bread you can cut through the whole sandwich as advertised. We have every set of these and all are fun! Possibly available locally at People's Pharmacy although I have not noticed them in stock for a while. Mini Cutter sets. I very likely have too many to count! These are some of my favourite sets. I also have various Halloween, Christmas, Spring and Easter sets. If you would like seasonal ones, the best local place is International Imports. At different "holiday" times they always have some Wilton mini themed cutter sets. Their regular selection of mini cutter sets is usually quite limited but worth a look. Metal cutters work for everything and are good for cutting hard veggies like carrots with ease. Plastic ones are good for softer items like ham, cheese, fruit, bread. You can still cut harder items with them but you will need to push with some force. If it seems really tricky use a hand towel to avoid hurting your hand or use a thinner slice! Stamps. Stamps are used to make an impression on the top of bread or a cookie. It's a great way to add a little flair to a sandwich without too much effort. Just stamp the top slice of bread only and assemble your sandwich. Here's an example using the bunny from the progressive cutter set. Silicone cups are good to hold something a little juicier, or corral small items together like grapes or berries. Also adds a pop of colour or adds to a themed lunch. Sauce containers are good for dip, salad dressing, yogurt, ketchup, sprinkles, mini chips, sunflower seeds, vitamins, gummies etc. The mini dippers on the left are larger than the mini sauce containers on the right. Those last two are true mini containers. FYI - Four of the EasyLunchboxes mini dippers fit perfectly inside the large compartment of the EasyLunchboxes container. Egg molds are used to shape boiled eggs into a cute shape. Rice molds are used to shape rice. Only one of my children likes cold rice so I don't use the rice molds very often. On the other hand, I can't make boiled eggs fast enough so those egg molds get a workout. There are also character egg molds available. Bento picks, cupcake toppers and cupcake rings. These are a few of my favourite ones. There really are so many to choose from. It's hard to pick just a few. I use a small items tool box (or 2!?!) from Masters to hold them all. You can use these to add a little fun to lunch. Longer picks can be used kabob style and smaller ones can be used as an eating utensil to spear small items like grapes. These are not recommended for children under 3 and supervision would be required for all little children since you don't want them choking on the picks! When my younger children had picks for the first time I only used them at home and stuck to ones with fork like bottoms until they were used to the whole concept. Cupcake rings would also be good starter items for younger children still with supervision. Probably the least used items in my supply box, mostly because I forget about them! Intended for traditional style bento when you need to put a barrier between two items. Also great for a little decoration in a regular lunch.These are the ones that I use the most, there are loads of others available. These are my most used items -set of three tools including a very sharp cutting tool with slanted edge great for cutting apple designs and cheese details, nori punches for really cute details, angled tweezers for placing delicate details, food colour markers. I often forget to include a photo of our cutlery in lunch photos. Mainly because I am rushing the photo and the cutlery, napkins and Lunch Box Love notes are already packed! These are the ones that my girls like the best. You can also find the Stainless Steel spork locally at People's Pharmacy. As my children's school has a trash free lunch policy, they always take a cloth napkin to school. In the past, we have just used plain cloth napkins that are usual for the home table. Near the end of the school year, there was a school fundraiser to purchase Funkins napkins. I purchased several and the girls love them! There are so many reversible fun designs and the quality is great. I highly recommend them. Lunchbox Love Notes - there are many volumes and these are a fun surprise. One side has trivia or a joke and the other side has a positive note - for example - "You're beautiful inside and out." Each pack also includes a couple that are blank on one side for you to write your own personal message. Here's one or two in action! Label it all so your most loved lunch packing items make their way home when misplaced! Mabels Labels - my favourite labels by far. This year we are trying out the Tween Labels as a fun new addition to our labeling line up. using all of these fun items? Now that I've mentioned all of my favourite supplies you may be thinking about researching some new lunch menus. I have two recommendations for you. 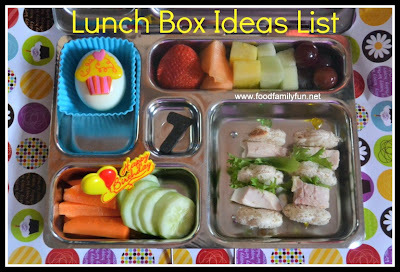 Momables and my Lunch Box Ideas list. Momables is a lunch menu service. You sign up for a subscription and they publish weekly menus with 5 lunches and a shopping list plus some tips. Each lunch menu has a photo. There are also many other recipes on the site that you can gain access to with a subscription. There is a conventional menu subscription option or a gluten free menu subscription option. I have the conventional subscription. My Lunch Box Idea list is a list of items that I print and keep on my fridge to help me with menu planning and shopping. It also saves me from standing in front of the fridge with the door open pondering what on earth I am going to make that day! Well that is a pretty comprehensive list of my favourite things. If you have any questions please ask - I always love to chat about packed lunches.